Last week was my first time at my new community garden plot. While it’s still a bit too cold to start planting, we went to work installing a new door into the garden and re-installing some fencing. It felt great to get out in the dirt again. 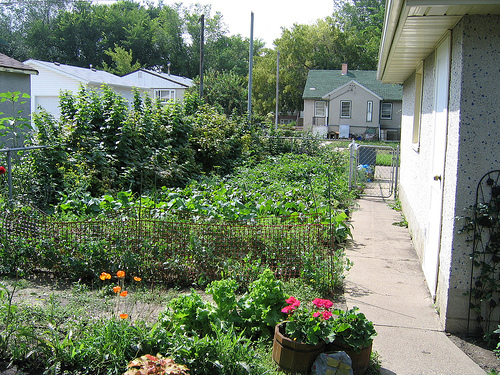 Looking for a Community Garden Program near you? Try the ACGA website. This year will be my second year with the Community Garden program. Last year I was disappointed when the deer got in not once- but twice, and ate everything in sight. This year I have a new plot at a new garden, which has a tall fence and is way nicer! I’m so excited because the soil is wonderful, and the garden is right across the street from where I’m going to be living. I learned a lot of lessons last year, and I think this year is going to be much more successful! I’m going to weed my plot really well this year before I plant anything, and I’m also going to add some organic compost a few weeks before planting. Because I’m in zone 3, I’m going to wait until early June to plant most of my stuff. I’ll probably plant onions and potatoes within the next week or so. I’ve already started my tomatoes and peppers from seed, so hopefully I won’t have to buy any plants this year. I’m also planning on sowing bush beans, romaine lettuce, spinach, zucchini and basil plants from seed. I’m also thinking of trying to grow eggplant this year, but I don’t know much about it. Has anyone grown eggplant before? If so, let me know if you have any tips for me! I will try to get some pics of my site up sometime soon. I don’t have a camera of my own right now:( Luckily, I have someone who let’s me borrow theirs for the time being, so watch for photos! Previous PostThe Most Beautiful Flowers in the World.